The United States Congress designated the Sipsey Wilderness (map) in 1975 and it now has a total of 25,770 acres. 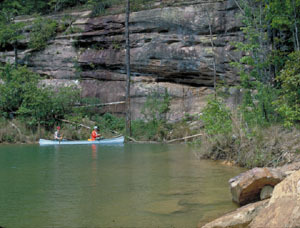 All of this wilderness is located in Alabama and is managed by the Forest Service. Wild-flowing creeks in northwestern Alabama converge to become the Sipsey River, 61 miles of which has been designated Wild and Scenic. Running below sandstone bluffs that rise 30 to 100 feet above the water, through a forest of often imposing second-growth trees and occasional small stands of virgin timber (some of the last virgin timber in the state), the Sipsey and its tributaries slice neatly through the Wilderness. Sinkholes, small caves, and scenic overlooks are plentiful. Less plentiful is the rare flattened musk turtle, an inhabitant of the Sipsey. Twelve established trails, all rated easy to moderate, crisscross the area. Several depart from the Sipsey River Recreation Area on the southern boundary, which has sanitary facilities, no developed campsites and a $3.00 recreation use fee. From here, Trail 209 follows the river north and joins Trail 206 after about eight miles, ending after about 2.5 more miles at a parking lot on the northern boundary. Trail 200 runs north along Borden Creek to meet an old road that gives access to the heart of Sipsey Wilderness; it, too, ends at a parking lot on the northern boundary. A 13-mile loop is possible by taking Trail 204 from the old road and following Trail 209 for the return to the recreation site. Sipsey trails receive moderate to heavy human use year-round. Wilderness camping, building campfires, hunting, and fishing are permitted. Horsepackers are allowed on designated trails. Planning to Visit the Sipsey Wilderness? How to follow the seven standard Leave No Trace principles differs in different parts of the country (desert vs. Rocky Mountains). Click on any of the principles listed below to learn more about how they apply in the Sipsey Wilderness.